I am attempting to visit all 30 MLB ballparks over the next several years (decades? 🙂 ). As I complete them I will attach all previous reviews to the top of the most current post in the series. I already have trips planned for St Louis and Kansas City next year and I hope to add a few more ballparks later in the season. 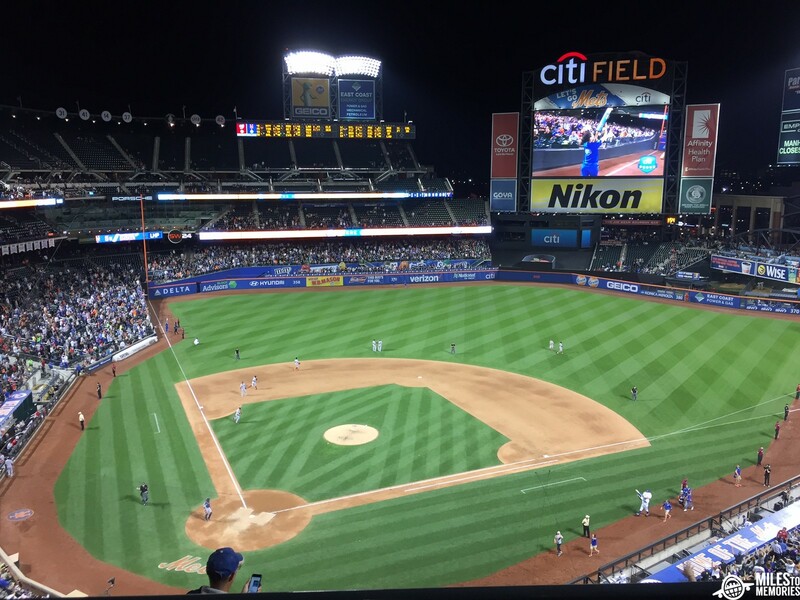 The very first stadium I am reviewing in this series, and the only one this year, is Citi Field in Queens, New York. It is the home of the New York Mets. Citi Field is one of the newer stadiums in the MLB, opened in 2009, and it shows! The outside area, structure, and color scheme are beautiful, but the interior area did have some drawbacks. The exterior of Citi Field is really beautiful. It comes with a perfect mix of metal and brick. It has a classic type of look to it, a fad that started way back with Camden Yards. On the way to the main entrance you pass the home run apple from Shea Stadium, which I thought was a nice touch. The brick columns upon entry are beautiful, especially when lit up at night. You enter a foyer type of area with a two story escalator that takes you to the seating area. To the right of the escalator is the Mets Hall of Fame and Museum. I liked that they kept the museum away from the regular commotion of the game so that anyone really interested in it would not be distracted by loud fans etc. The Mets Hall of Fame and Museum held their two World Championship trophies, retired player plaques, a Mr. Met statue, and other historical info and pictures. It was smaller but really well done. It leads into a large gift shop. Once you take the escalator up you are met with a brick wall which I found strange and not well thought out. You had to walk a decent distance to get a view of the field. I prefer ballparks that have a view of the field from all angles. These enclosed areas made the concourse areas in the infield surprisingly dark. My guess is that it was set up this way to put in more suites, which there is a lot of them. Walking around the stadium is a little disjointed. Some areas that you think would be accessible are closed off to regular fans. I personally prefer stadiums where you can easily walk around the stadium. The outfield area is the prime jewel of this park. It is a large area that incorporated some parts of the old Shea Stadium. It also has a good variety of kids activities, bars, and restaurants. To be fair the accessibility is great, the subway stop exits right at the main entrance to the stadium. But, the surrounding area is non existent. If you want to hang out prior to the game and grab some beverages and food your best bet is probably to go across the river to downtown flushing. If you walk down Roosevelt Avenue about 3/4 of a mile then you will come to Roosevelt Sports Bar which is supposed to be a good place to stop before or after the game. The bar happens to be around the corner from a Hyatt Place as well, which may be the best deal in the NYC area for award stays. The other option is McFadden’s which is attached to the ballpark. Accessibility gets a very high rating in my book. We took the 7 Diamond Express train (nights only) to the stadium and got off at the Mets-Willets Point station. This puts you steps away from the front entrance. On the way back we took the 7 local, which didn’t seem to take too much longer, even with the extra stops. There seems to be a decent amount of parking on site in the lots directly outside the stadium. But, the subway is definitely the way to go, especially if you are staying in Manhattan. The all important food category! Around the infield the food is very average and so-so. Standard ball park fare, Nathans hot dogs, nachos, ice cream etc. The outfield is where the food selection really shines. They have a Shake Shack (PDX is booking his tickets now), Two Boots Pizza (one of my personal favorites), Papa Rosso (Pizza), A Jim Beam Bourbon Bar, Fuku (chicken), Nicoletta (really wish I had tried this one), and Catch of the Day (seafood, LOBSTER ROLLS). There is a lot of variety listed above. I mean lobster rolls, am I right? I did knock it down a few pegs because it was almost exclusively located in the outfield which makes it tough to get to for some of the fans. 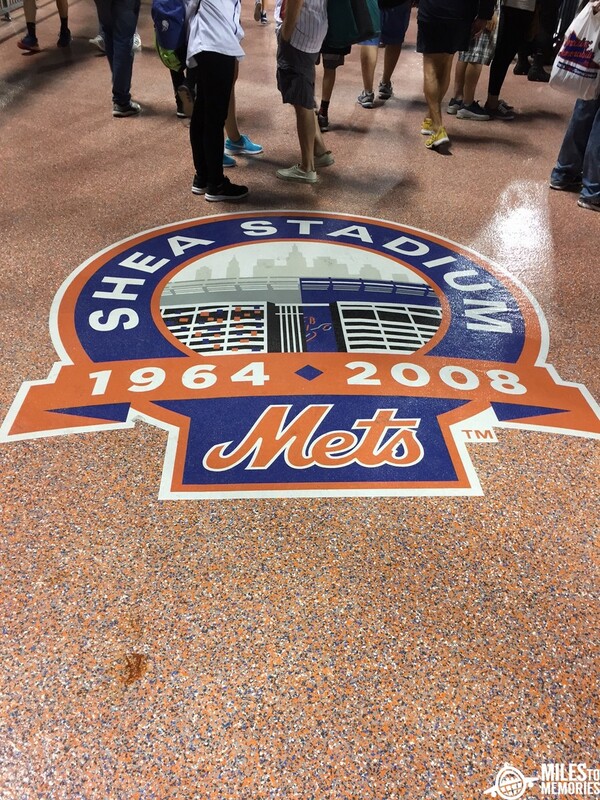 I loved how they brought in bits and pieces of Shea Stadium when building Citi Field. I wish my own local team, the Detroit Tigers, would have done some of that when building Comerica Park 17 years ago. Having the Shea Bridge put into the park was an outstanding idea! The old apple put outside the park was another nice touch. They also added in a nice floor stamp remembering the stadium that ushered in two World Championships. Another idea I thought was pretty genius was putting a large TV on the back side of the scoreboard. This showed live game action and allowed people to still enjoy the game while they were dining at one of the many eateries. There weren’t a ton of activities for kids but what they lacked in quantity they made up for in quality. They had a small ball park set up where kids could play wiffle ball. They also had an area where you could pitch and try to hit the mark for the dunk tank. Not as much as I have seen at other ball parks but they were both high quality ideas. Overall the ballpark was beautifully crafted, as expected since it is one of the newest ballparks in the MLB. The outside design is truly beautiful at night. When you walk off the the subway steps you are met with a beautifully lit design. I do wish they would have lit up the old home run apple some. The two story entrance area was pretty breathtaking as well. I do wonder if it slows down people getting into the building at peak times though. I liked that they had the hall of fame/museum area on the main floor, away from the rest of the ball park. It allows people to take their time in there without distractions. And the attached gift shop looked like the largest one in the ballpark. The interior design was a little underwhelming. The lack of field views throughout chunks of the stadium was a mistake in my opinion. It also made the corridors very dark since you didn’t get the ambient light from the bright field lights. The outfield is for sure the crown jewel of the ball park. It offers a great area to hang out, grab some food and drinks, and relax after a long day or week. If I were a Mets fan I wouldn’t be opposed to buying standing room only tickets, or the cheapest seats available, and just hanging out around that area when catching a game. Here are some more photos for you to check out! Citi is certainly an upgrade from Shea, which, of course, was built in a different time. I always felt the escalators at Shea were dangerous. Nothing to either side of them, except straight down. The subway is a great way to get there, certainly less stressful than driving in NYC. It’s not ATT Park, but Citi is certainly a good MLB park. Agree on all points! Didn’t someone die from falling of the escalators at Shea once? I remember them being a little freaky as a kid. Thanks for reading! What a terrible idea for a feature. How is this even related to this blog. Thanks for reading and commenting Bart Simpson – I appreciate the support. I still need to check it out. The roof deck bar looks pretty awesome too!